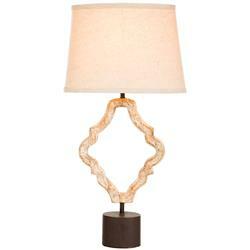 Open and eclectic, this heraldic, quatrefoil gold table lamp combines old fashioned elegance with modern convenience. A dark wood, cylindrical base holds a gold, geometric pedestal. Crowning the single-bulb light fixtures are two natural, round drum shades.